Once upon a time, Goldilocks, who was, as is well known, a serious gardener, was getting a bit antsy. It was an especially warm day in February, bright and sunny, and she just felt as if she had to sow something. So, she got out her seed packs and sowed a tomato seed. As she finished, she noticed on the seed pack that it recommended sowing tomatoes 6 weeks before the last frost date. Upon further consideration, though, she relaxed. “Well, that’s actually a good thing. It’ll just be extra big when I plant it out and I’ll have tomatoes even earlier in the season.” And so, she continued watering and fertilizing and caring for her seedling. “It’s too tall!”, lamented Goldilocks! At first, it grew vigorously and she was thrilled. But then it began to look a bit spindly: pale green and overly tall. Soon, it was so tall and weak it began to flop over. “It’s too tall!”, she mused. Still, she carried on, supplying stakes to hold it up. Before long, the weak stem reached the ceiling! Heavens, the plant even began to bloom indoors, but only very weakly. When spring came around and the ground warmed up, she carefully planted her big, weak tomato plant in the garden, but it failed to thrive at first. By the end of the summer, it was finally starting to recuperate, but then frost hit. Goldilocks failed to make her famous red tomato chutney that year. “It’s too small!,” moaned Goldilocks. The next year, Goldilocks promised herself she wouldn’t make thatmistake again. “No more sowing indoors,” she thought. “It’s just a stupid waste of time!” Instead, she sowed her tomato seed directly outside when the air and the soil warmed up. And up came the seedling and it grew well and vigorously. But it was September before the first flowers appeared. “It’s too small!,” she thought. “Really too small!” Before long, frost came and killed the plant before it had produced a single ripe fruit. Goldilocks was, however, able to make some green tomato chutney that year. Year 3 came around and, by mid-February, Goldilocks was again getting fidgety. So, she took out the tomato seed pack and reread it carefully. “Start indoors 6 weeks before the last frost,” she noted. “Maybe I should try that? !” So, instead of sowing the tomato seed right then, she waited and took out her gardening frustration by repotting a few pelargoniums. “This one is just right!”, said a very pleased Goldilocks. When she did finally sow the tomato seed indoors, 6 weeks before she figured the soil and the air would be warm enough to plant it out, the seedling again began to grow well. By the time the weather warmed up, it was short and leafy, without a flower bud to be seen, but sturdy. Goldilocks beamed. “This one is just right!” So she planted it out. Up it came, growing strongly and soon it was in bud, then it was covered in fruit. Before long, she had so many ripe tomatoes she made an extra huge batch of red tomato chutney and shared them with all her storybook friends, including Red Riding Hood, Grandma, Rapunzel, Papa Bear, Mama Bear and Baby Bear. So, readers, did you get the message? There’s a “Goldilocks period” for every kind of seed, a spot in time when it’s “just right” to sow it. Starting it too early is of no help and as for late … well, there is still something to be said for “better late than never” and sowing seeds a bit late is less harmful than sowing them too early. Still, try getting your sowings “just right.” Gardening life is so much simpler that way! Where to Find Out When to Sow? Try the seed pack. It usually gives an appropriate date on either the front or the back. If not, a book on sowing seeds would be helpful. Or visit a website that covers growing plants from seed. 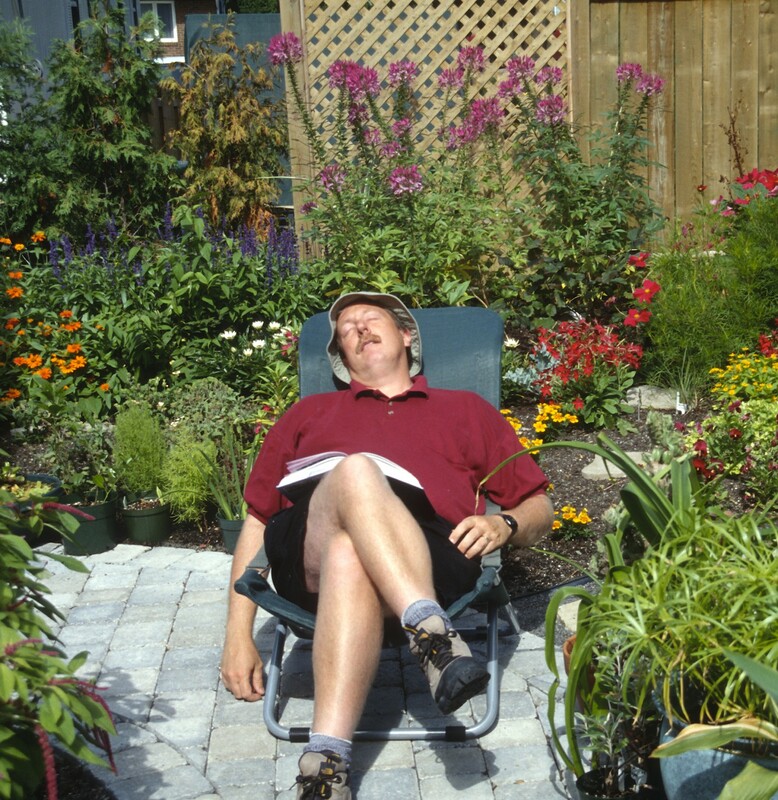 In fact, why not the Laidback Gardener website? Try A Timetable for Sowing Vegetables and Herbsor Timetable for Sowing Annuals Indoors. Best of luck to all the Golidlocks out there!